5 Amazing Health Benefits of Ancient Ayurvedic Cooking Oil ! As health experts finally begin to lift their long-held (and unjustified) ban on saturated fats, the popularity of coconut oil and grass-fed butter has skyrocketed in recent years. But while these two fats are undoubtedly superfoods, there’s another type of fat that just might be even healthier: ghee. Similar to clarified butter, ghee is made by slowly and gently heating butter to concentrate its nutrient density and create a truly delicious cooking oil. Ghee is positively loaded with fat-soluble vitamins, heart-healthy fatty acids and other beneficial compounds that make it one of the healthiest fats you’ll ever eat. In this post, we’ll explore the rich history of ghee, the process by which it is made, and how it can enrich your life and boost your health. Traditionally, ghee has been a part of Hindu culture for thousands of years. According to archaeological records, ghee was first used in Hindu fire sacrifices over 5,000 years ago, and it remains a staple cooking oil in Indian cuisine to this day. The ancient medical practice of Ayurveda also has strong ties to ghee, which is used as a key ingredient in many Ayurvedic medicines. Along with sesame oil, muscle fat and bone marrow, ghee comprises one of the four key oils, and is considered highly beneficial in the treatment of many diseases. The process of making ghee is actually quite simple, and is very similar to that used to create clarified butter. To make both, butter is simply heated until all of the water has evaporated and the milk solids have separated from the fat. By skimming the milk solids, the proteins and sugars that many people can be allergic to (like casein and lactose, respectively) are removed. At this point, the product is essentially clarified butter. The next step is to simmer the clarified butter until it turns a rich golden brown, which intensifies the flavor profile and increases the smoke point (more on that later). By this time, ghee has been created! By simmering off the mild solids and water from butter, the process of making ghee takes a superfood and makes it even more super. More vitamins, more healthy fats and more flavor… sounds like there should be a catch, right? The research shows that there isn’t. Ghee is one of the healthiest foods on the planet and here’s why. For those of you who love butter, but can’t eat it due to common allergens lactose or casein… rejoice! Ghee provides the solution, without compromising on flavor. Typically, people with a dairy allergy have an intolerance to either lactose or casein. Lactose is the main form of sugar found in milk, while casein is a type of protein in dairy products that can cause symptoms like swelling, hives or congestion. Both of these compounds are skimmed off in separated milk solids while making ghee, leaving only the healthiest, allergen-free portion of the butter… the fat! The fat-soluble vitamins A, K2 and E are some of the most critical to our health and wellbeing, but most of us aren’t getting nearly enough of them each day. Like butter, ghee is positively loaded with all of these vitamins, making it an important source of nutrition. 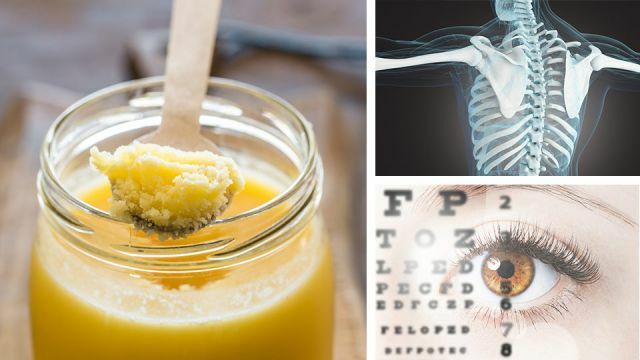 This means that getting more ghee in your diet will help to improve your bone health, boost your vision and plenty more besides. Considered one of the healthiest fatty acids on the planet, conjugated linoleic acid (CLA) is often hard to come by in the average American diet. But you can change all that simply by introducing ghee into your life. The health benefits of CLA are many, and include an ability to reduce body fat, lower risk of cancer and fight disease-causing inflammation. This means that getting your daily dose of ghee gives you access to all these benefits, especially when your ghee is sourced from grass-fed cows. Chances are, you’ve never heard of butyrate… but your body depends on it all the same! Butyrate, otherwise known as butyric acid, is a short-chain fatty acid that plays several important roles in the human body, particularly with regards to the gut. Butyrate has been shown by research to improve insulin sensitivity and energy expenditure, suppress chronic inflammation and improve symptoms in conditions like Crohn’s disease. By eating ghee, you’re upping your butyrate intake, which is definitely a good thing! When it comes to cooking oils, smoke point is king. Smoke point refers to the temperature at which an oil or fat begins to smoke… not exactly rocket science, right? But what this means is that when the smoke point is reached, the beneficial compounds in the oil begin to denature and the fats begin to oxidize, exposing the food you eat to harmful free radicals. Oil that’s reached its smoke point also tastes nasty and is at risk of catching fire. Ghee is a great choice for a cooking oil due to its high smoke point. With a smoke point of 485 degrees Fahrenheit, it’s considerably higher than most other cooking oils, including nasty hydrogenated oils like canola, corn and soybean oil. It also has a higher smoke point than butter, making it a great substitute for higher heat frying, sautéing and baking.